This file photo shows Evans after he was arrested in 2017. 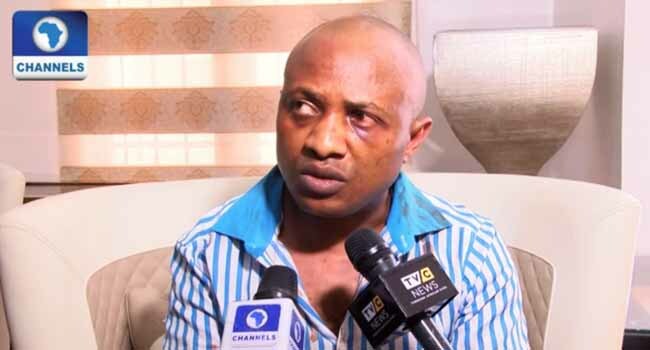 The trial of the suspected kidnap kingpin, Chukwudumeme Onwuamadike, also known as Evans, was on Thursday adjourned following the absence of the prosecution witness at the Lagos High Court in Igbosere. Justice Adedayo Akintoye adjourned the trial till September 14, after assurances from the prosecution counsel Adebayo Haroun that the witness, a police inspector, would be available to testify today. The prosecution counsel, Adebayo Haroun told the court that the witness who is a police inspector was engaged elsewhere for an official assignment. “The witness is on another assignment. But he will be here tomorrow,” he said. Evans is facing two separate charges bordering on conspiracy kidnap, kidnapping and attempted murder before Justice Adedayo Akintoye.